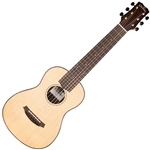 Here's a great deal on a complete guitar package containing a Cordoba nylon string acoustic guitar with spruce top and nato back and sides, travel gig bag, digital clip-on chromatic tuner with color display, 2 picks, and a guitar chord and lesson book. Cordoba is well known for making guitars that offer excellent quality and value. A staple in the Iberia series, the Cordoba C5-CE features a solid Canadian cedar top and mahogany back and sides. The construction is based upon the traditional Spanish Classical guitar with the exception of a soft cutaway and a slightly thinner neck. The Fishman Isys+ 2-band pickup system produces a rich and natural sound when amplified - perfect for gigging and recording. Aesthetic touches like the mother-of-pearl weave rosette inspired by a 1920’s Domingo Esteso guitar add a touch of vintage elegance to this best-seller. Other premium features include a rosewood fingerboard, rosewood bridge, high gloss finish, and Savarez Cristal Corum strings. The C9-E includes Cordoba’s lightweight polyfoam case.